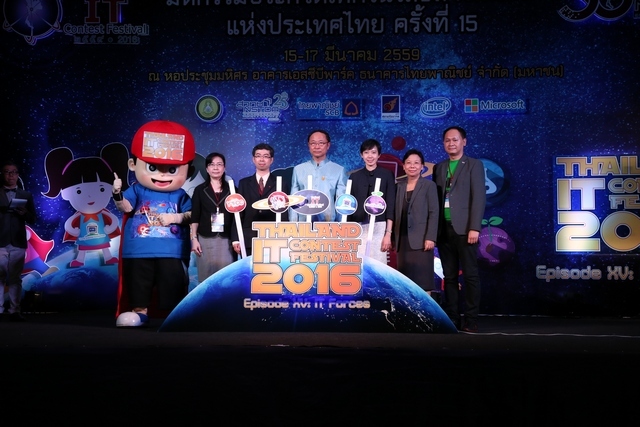 "Thailand IT Contest Festival 2016"
Dr. Pichet Durongkaveroj, Minister of Science and Technology, presided over the opening ceremony "Thailand IT Contest Festival 2016", an ultimate tournament innovative contest in information technology of the skill and intellect of youth from across Thailand, continuously organizing by National Electronics and Computer Technology Center (NECTEC). The objective is to promote and support the development of knowledge, the ability of youth in Thailand in electronic, computer and information technology to develop the project of science, technology and computer that can be applied to the benefit of the economy and society, reducing reliance on foreign technology, and cultivating a collective promotion of personnel development of the country. This will be an important foundation for the development of industry and the national economy under the theme "From STEM to Startup: Creating human resources, cultivating Startup Business of Thailand”. The contest will have the ultimate IT innovation created by youth from across Thailand.